Above, a scene today from Pakistan, where millions of people face a dire situation after monsoon rains that have caused catastrophic flooding across the country. More than 1,500 people have died in flooding that dates back to last month, and worsened in the last few days. 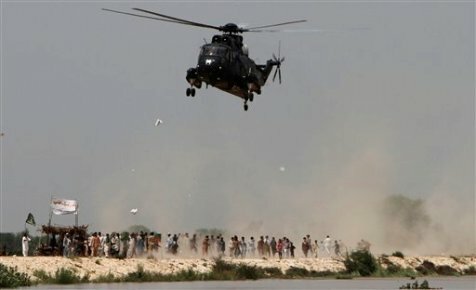 Pakistani officials have said it’s the worst natural disaster in their nation’s history and evacuated villages in several parts of the country. This Time story details the devastation well. With that in mind, the U.S. is sending in Marines with the 15th Marine Expeditionary Unit, out of Camp Pendleton, Calif. The amphibious assault ship Peleliu arrived off the coast of Karachi, Pakistan’s capital, within the last 24 hours, and CH-53E helicopters already have made trips to deliver supplies and water. I’ve reached out to 15th MEU spokesmen for additional details. In the meantime, here’s sending good vibes to the Marines and sailors who will be assisting in Pakistan over the next few days. My prayers are with you all…stay safe while you help these poor people. My son in a Marine with the USS Peleliu and I couldn’t be prouder of him. My son is also a marine on the Peleliu. We are proud of all of the military personnel who work together to “Bring Peace through Power”. Yes indeed. You are the best of us and showing the world who we really are. Thank you. Proud mother of three US Marines a a really nice Civilian… Proud future mother in law of a deployed US Marine. My son is on the USS Dubuque / HMM-165. I could not be prouder of my son and his strike group…..They humble me . What a fine group of individuals. Stay safe everyone…We cant wait to welcome you home as the Heros that you are. PROUD MILITARY MOM IN SAN DIEGO.